In December 2015 Steph Vajda and Wendy Sarkissian worked with GTA Consultants to deliver a SpeakOut engagement event as part of the Wagga Wagga Integrated Transport Study. The Wagga Wagga Integrated Transport Study (WWITS) SpeakOut was held on Saturday 12 December 2015 from 9am until 12noon at the Civic Centre, Burns Way Wagga Wagga. These stalls were facilitated by Wagga Wagga City Council staff specialised in the specific issues and themes represented by each stall’s focus. While the WWITS SpeakOut was a modified version of the true SpeakOut process, the images still provide a good sense of how these events function and how people participate in them. Dr Wendy Sarkissian and Andrea Cook originally designed the SpeakOut engagement process in 1990. The SpeakOut is a lively, innovative, colourful and interactive staffed exhibition — a hybrid event combining some of the characteristics of a meeting and some of an exhibition or ‘open house’. The purpose is to provide an informal and interactive ‘public meeting’ environment where a wide range of people have a chance to participate. It is designed to facilitate structured ‘drop-in’ participation about planning and design issues. Participants come to the venue, find the issues on which they wish to ‘speak out’ and have their say. A SpeakOut is used in any community planning process and can be organised at the start of a process — to introduce a community to a project and generate early enthusiasm and participation — or at the end of a process to ‘test’ material generated in other consultation processes and ‘wrap up’ a substantial consultation phase. The applications of SpeakOuts are really only limited by one’s imagination, as it can be tailored to a number of issues and to a range of communities. 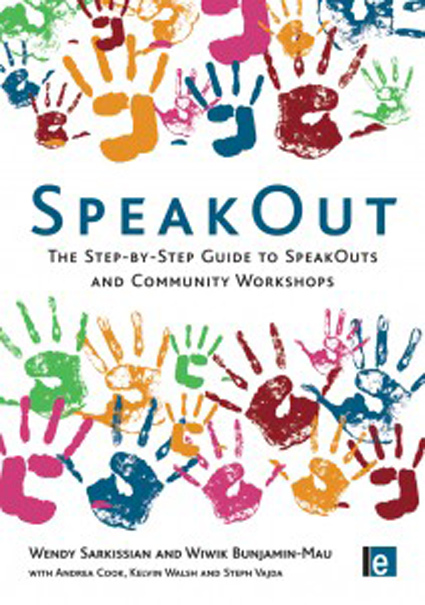 A SpeakOut has broad appeal and allows a wide range of participation. The SpeakOut works well where specific community feedback or input is sought (for example, a redevelopment, a design process, a needs analysis, etc.). It can be effective when wide community participation is sought and a less structured time format than a formal public meeting or workshop is acceptable (or desired) — as a result, it attracts a great deal more interest than the typical public meeting (a SpeakOut generally attracts several hundred people). It can be used in the early stages of a participation process to gather ideas (issue identification) or in later stages where the results of studies/planning are being communicated back to community members. For more information on the SpeakOut model, refer to Speaking Out in Community Engagement: A Review of Fifteen Years of Refinement of the SpeakOut Model by Wendy Sarkissian and Andrea Cook. Looking for leading practice award winning engagement services?